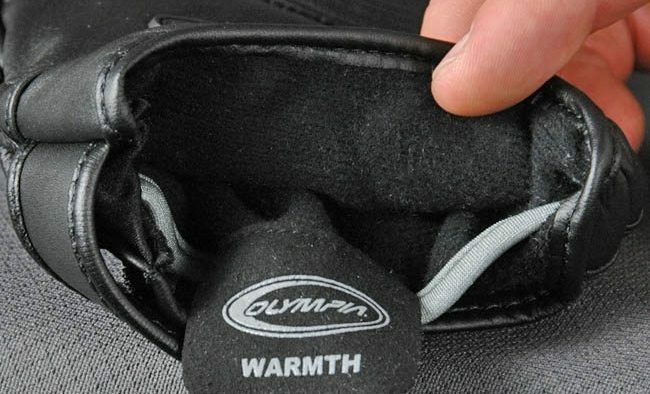 New for 2011, the Olympia “Switch” gloves are so named because of their dual-purpose liner. Slide your hand over or under the non-removable liner for your choice of warmth or grip. These are a good-looking pair of gloves and — surprise — they actually fit as expected. 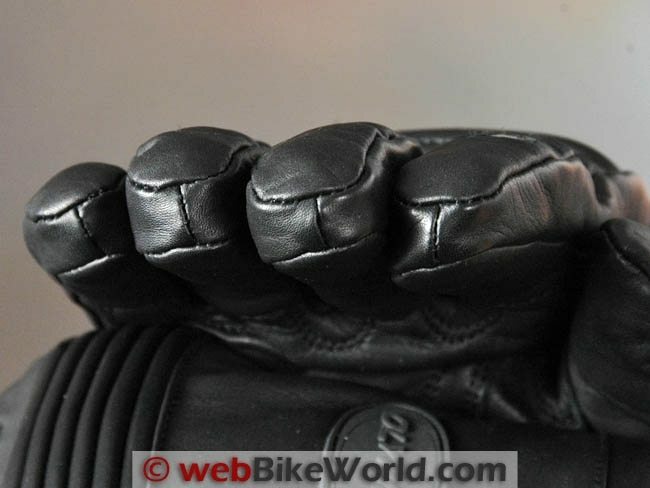 The faux carbon fiber “knuckle protectors” are lame and give the gloves a cheap appearance, besides doing absolutely nothing because they’re paper-thin and they don’t actually cover the knuckles. 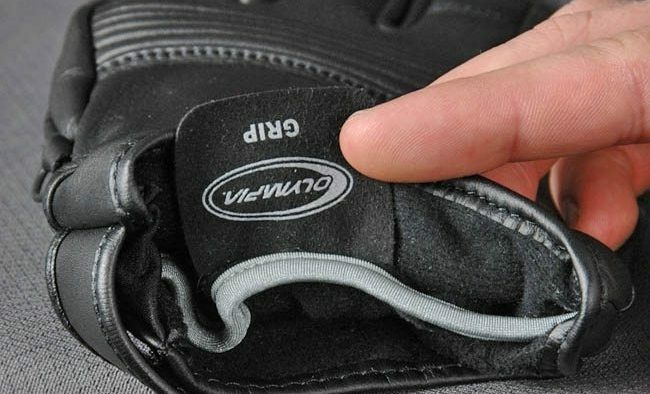 The “Switch” name refers to the unique liner in these gloves. 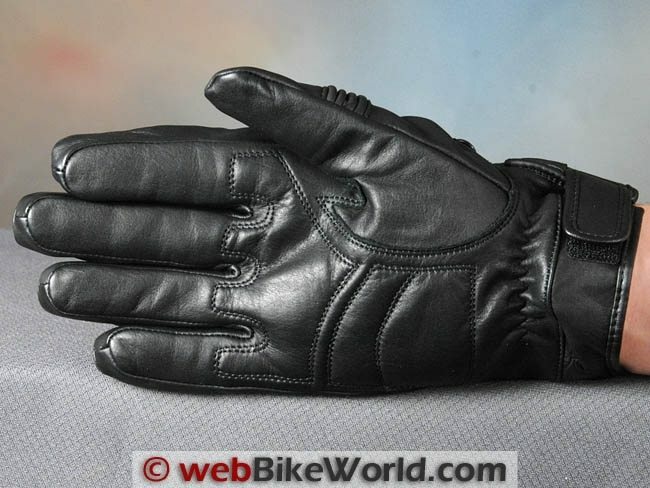 It’s a dual-purpose liner; slide your hand over the top of the liner and you have a nice, lightly insulated and comfortable leather glove with lining on both side of your hand. 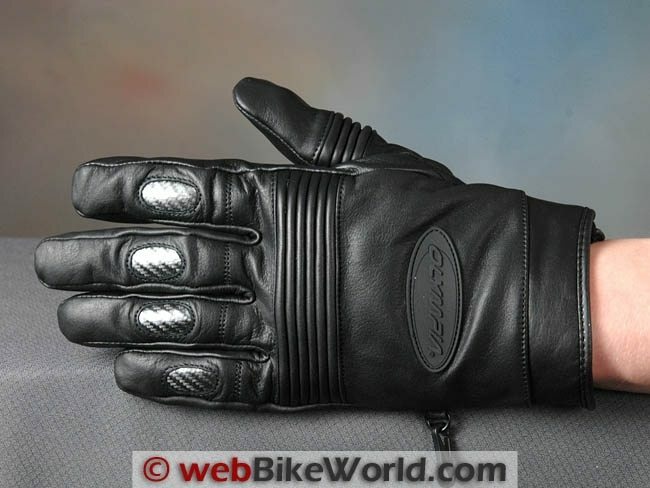 Slide your hand under the liner and the double layer of insulation now covers the back of your hand, leaving only the leather underneath. Perfect, perhaps, for heated grips? 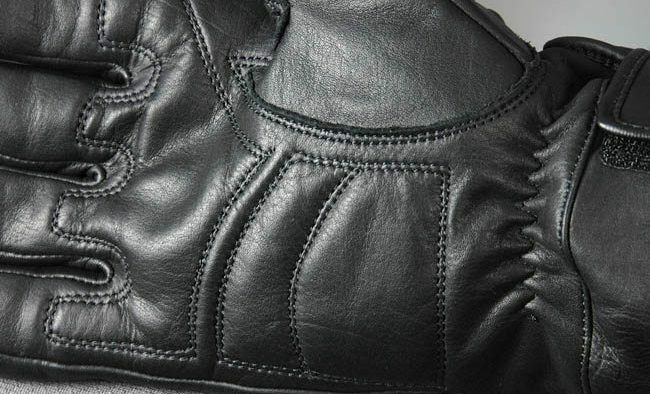 The leather used in the body of the Switch gloves feels very soft and supple and the stitching is first-rate — in appearance anyway. 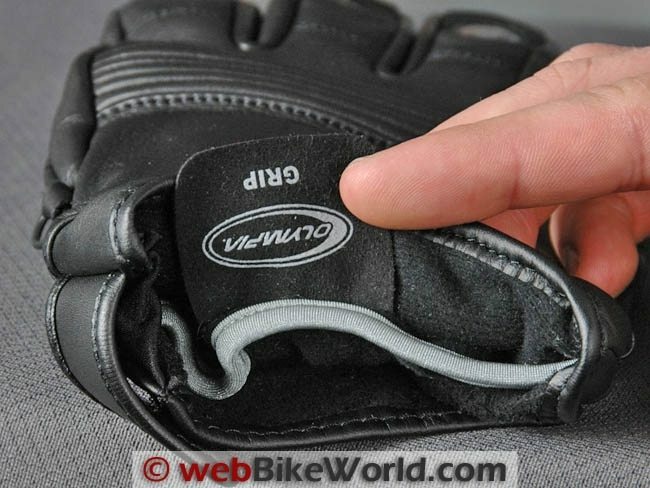 I still have some doubts about how it might hold up in a crash, based on the price of the gloves. 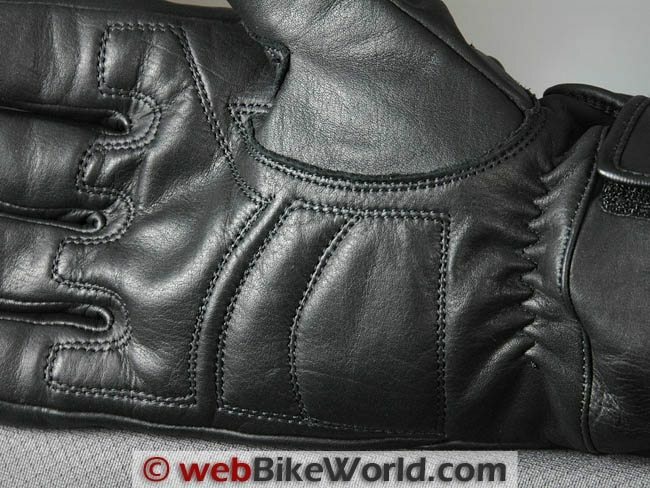 The gloves feel very flexible — almost like the leather has some type of elastic sewn in. There’s a nice accordion pleat across the back of the main knuckles; it probably does nothing for abrasion protection, but it adds a lot of flexibility. And guess what? These fit exactly to size. 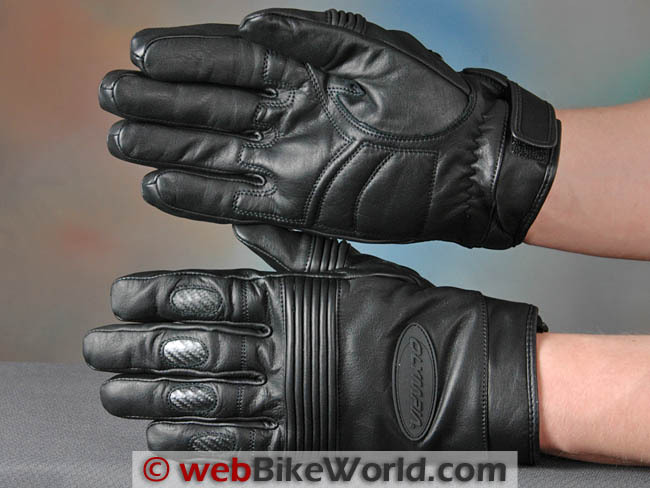 So Olympia does know what making a glove to a standard size really means. What about the rest of the lineup? The palms look like they have an extra layer of leather but it’s not — just some stitching to give it the appearance of an added layer. Kind of like cheating, no? 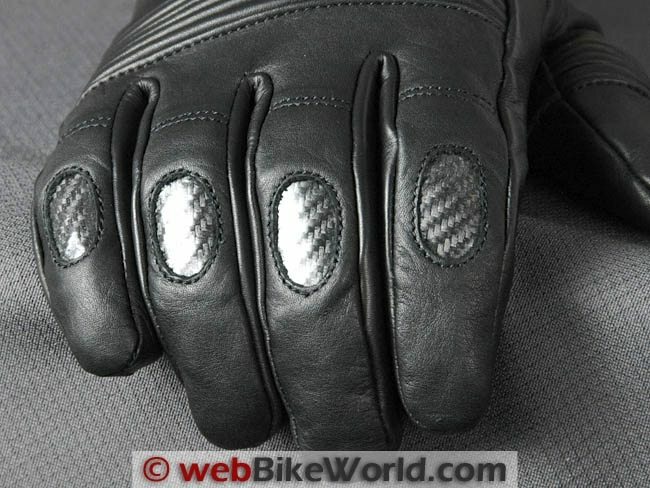 And speaking of cheating…the cheap-looking “carbon fiber” “knuckle protectors” on the fingers is pretty lame. The gloves would look and perform much better without it; as it is, it ruins the overall appearance of the Switch gloves, in my opinion. The tiny tab on the underside of the wrist kind of cinches up the short gauntlet, but it does nothing for security. 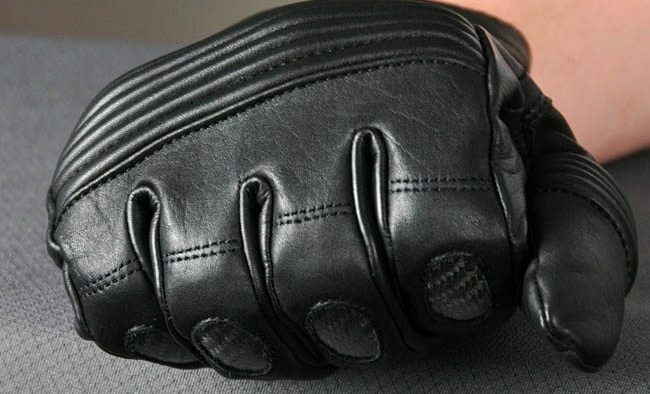 You can pull these gloves right off the hand with no problems. Bummer. Here’s what I suggest to Olympia: you have a potential winner here. Make the liner waterproof and windproof. Ditch the ugly “carbon fiber”. Use the same cinch strap found on the 180 Monsoon gloves. 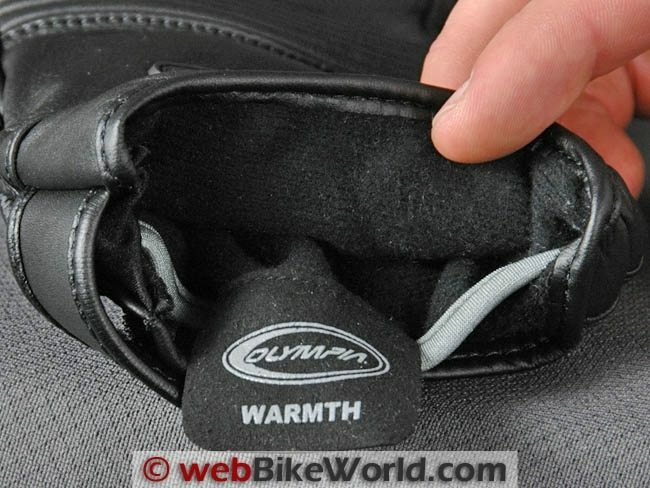 Add some extra layers of abrasion protection on the back of the knucks, the heel of the hand and the palm. OK, so you have to charge another 10 bucks or so. Who cares? You’ll have a glove worth buying. 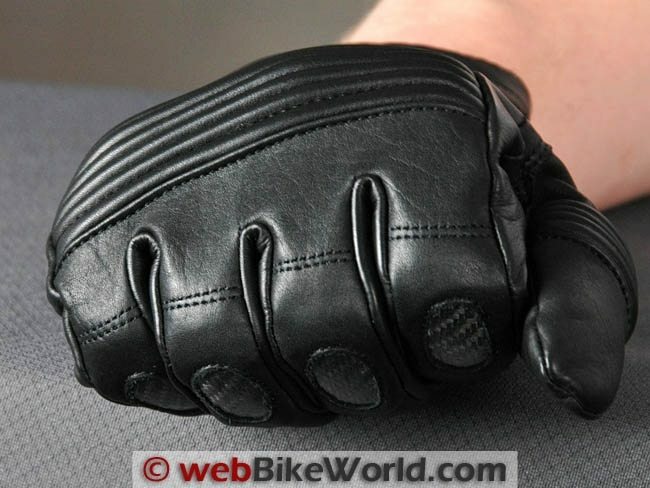 I thought the new-for-2011 Switch gloves would have the latest and greatest Olympia technology, based on their experience in manufacturing gloves for the last 60+ years of existence. I was interested in trying the dual-purpose insulation pocket. I thought the gloves would have better abrasion protection, at least on the palms. I expected them to fit. I also expected the security strap to offer some…security. 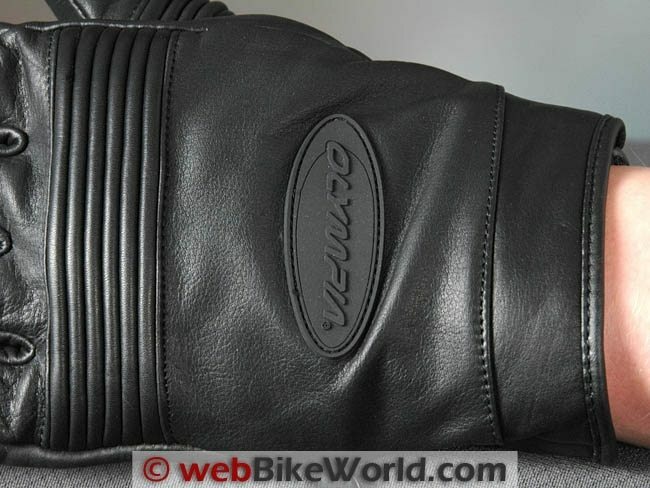 The leather looks great, feels soft and comfy and the stitching again has a quality appearance. The “Switch” liner is pretty cool and it works, although I can feel the seams in the gloves when the liner is on top of my hand. The liner provides good insulation. And the gloves actually fit as expected! The security strap doesn’t do much. 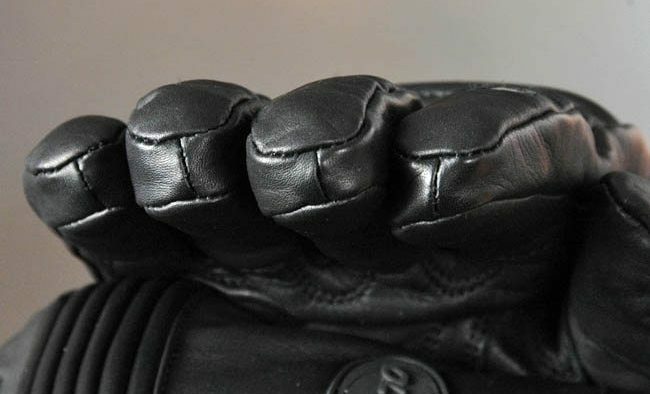 The knuckle protectors aren’t and there is no extra abrasion protection on the palms, although the stitching is faked to make it appear like there is. The Switch gloves are an interesting concept that needs more work. The faux carbon fiber is paper-thin, looks cheap and does nothing. The barely-functional wrist strap needs improvement also. 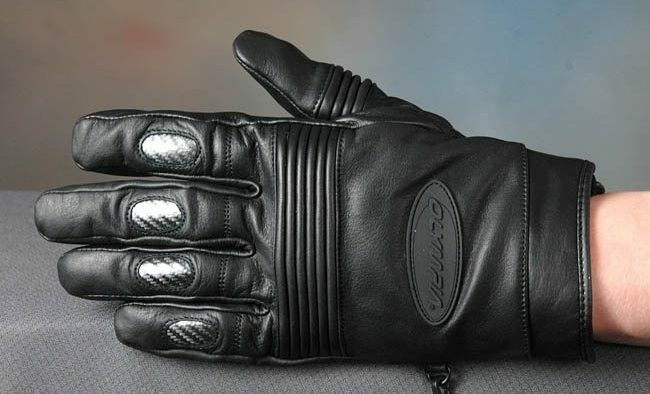 The gloves are comfortable and they fit, and the two-way liner is interesting, but even at the street price, I’m not sure these are worth recommending.